It is definitely christmas time, I’ve dragged an enormous piece of dying wood inside my house, covered it with sparkly tat and attached one hundred blinking bulbs to it. My kids are going crazy with having to memorise their parts in the school nativity, constantly hyper about what Father Christmas is going to bring them and there seems to be a magically self-replenishing stock of sweets and chocolates that they are raiding whenever our backs are turned. So without further ado… and before I have to run off to tend to the next “fizzy tummy” I’d like to share with you my top ten (or so) great gifts to try and cover all ages and all budgets for the scientists, science-lovers and general boffins in your life. At last! A mechanical servant to do your bidding – muhahahaa! Well maybe not quite. 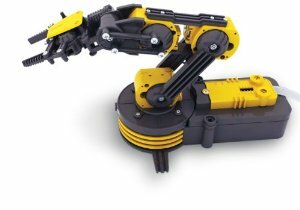 Looking very industrial in it’s black and yellow, this arm is a build it yourself kit that will keep the recipient occupied while building it and then while commanding it to do their bidding. 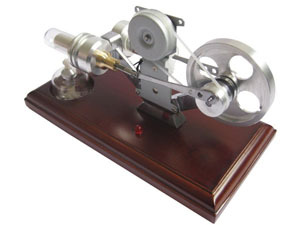 You could always try this if your recipient is more fond of pistons and wood than USB and code. 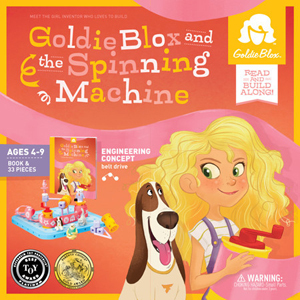 “Get girls building” That’s the aim of Goldie Blox the Kickstarter success story toy company with a line of products designed to “tap into girls’ strong verbal skills” by combining construction with story telling. A fantastic aim and one I can totally support. Their Rube-Goldberg video featuring a crew of three intrepid went viral (over a million views on YouTube) a few weeks back, only then to have the sound track re-dubbed with a new song following a bit of a spat with the Beastie Boys (who also love the idea but don’t allow any of their music to be used in advertising). Unfortunately it seems Goldie Blox have been a victim of their own success with the toys selling out and now going for more than double the original price on Amazon and Ebay, they’ve also experienced a bit of a backlash over helping the “princess” stereotype to persist and that perhaps having a story narrative alongside the nuts and bolts doesn’t fire up the creativity as much as a straightforward pieces+instructions sort of kit like LEGO. 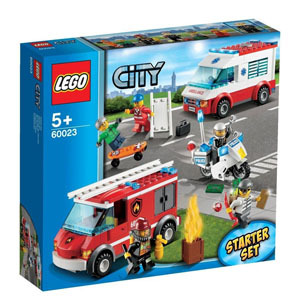 If you’re going to build things and are willing to risk the inevitable barefoot+brick casualties then maybe good old LEGO is the answer after all. Completely customisable, infinitely expandable and equally appealing to both boys and girls. I’ve got to hold up my hand and admit to being a bit of a glass geek – I’ve even written a series of blog posts over at LabTattle about it! 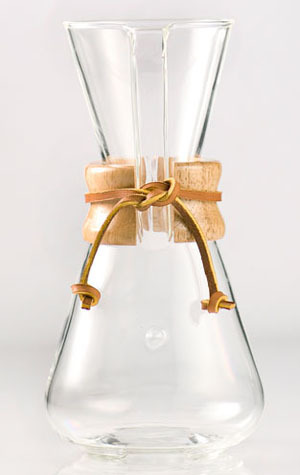 – and a coffee lover too, so there’s a special place in my heart for the Chemex coffee maker. The beauty is in the simplicity: made from borosilicate glass, leather and wood. The Chemex was designed in 1941, hasn’t changed since and can be seen on display in Corning’s Museum of Glass and the MOMA in New York City. As far as a simple cup of coffee goes you can’t really refine it much further than this. In my previous Christmas list I mentioned the rather expensive but beautiful Modernist Cuisine set of books, which at £300 was probably out of many people’s budgets. They have now come out with the (slightly) more affordable “At Home” version, the key here is the techniques are more accessible to people who don’t happen to have a readily available supply of liquid nitrogen or a 0.1°C accurate waterbath sitting on their kitchen counter. Kalys Molecular Gastronomy Kit – Cuisine Initiation Kit Everything you need to try your hand at Molecular cooking. Natural ingredients in handy pre-measured sachets with a set of tools and recipes. Molecule-R Cocktail R-Evolution Kit, Multi-Color Learn how to deconstruct your favorite cocktails and serve your mojitos in a large bubble that will explode in your mouth, bite into a layered martini or add a touch of airy lime foam to your tequila shots. This “do it yourself” molecular mixology kit allows you to recreate the atmosphere of the most trendy and modern lounges in the comfort of your home. Smartphones, tablets and phablets are pretty much ubiquitous now so why not give an app as a gift this year? Here’s a few of the neatest ones. 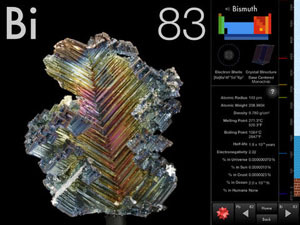 The Elements (iOS) – A gorgeous interactive look at the building blocks of everything from Actinium to Zirconium (US version also available). Science Friday (Android) – The latest science news: health, climate,technology, and the arts.NPR’s Science Friday®, with Ira Flatow. National Geographic Dinopedia (iOS) – with info, stats, art and videos on over 700 dinos this will be a great gift for anyone who loves a bit of paleontological action (US version). Fancy something to stay warm when you’re not in the lab but still need to express your scientific awesomeness? Then a customised onesie (or hoodie, or polo shirt) with your science-fan’s favourite molecule from KC-Workwear will be a real treat. They’ve got mugs too! Give a loved one the clap this christmas (Neisseria gonorrhoeae), the cute cuddly STI in its very own presentation petri dish. Not on such intimate terms, then maybe E. coli, S. aureus or even a whole Christmas Tree full of deadly pathogenic friends. This weather station really has it all, including a PC interface to upload to your computer. 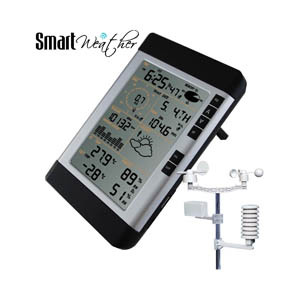 Measure windspeed and direction, temperature pressure and rainfall. Track changes and make forecasts. Next step… controlling the weather! 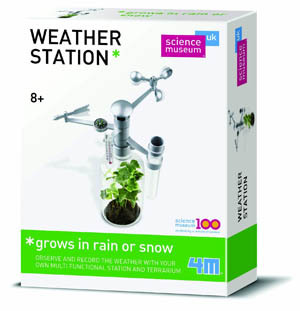 Great for if your meteorologist is aged 8+ and wants to see something growing at the same time, even in the snow. 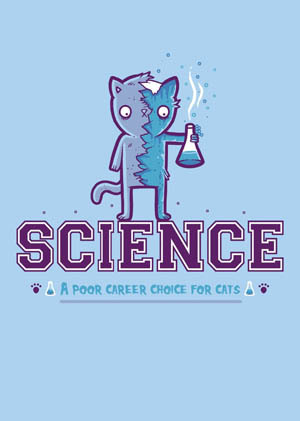 A poor career choice for cats? 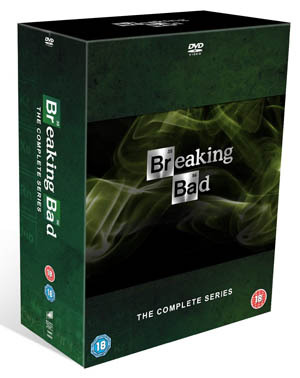 One of my favourite TV series ever, and was really sad to see it come to a close earlier this year (no spoilers here folks). The story of the somewhat wimpy chemistry teacher Walter White who goes into business with a former student manufacturing and selling their mythical blue meth. Whether you want to relieve all those moments of brilliance or introduce someone to the world of Jesse and Walt and their beat up RV, this is a classic. 50 hours of additional content!